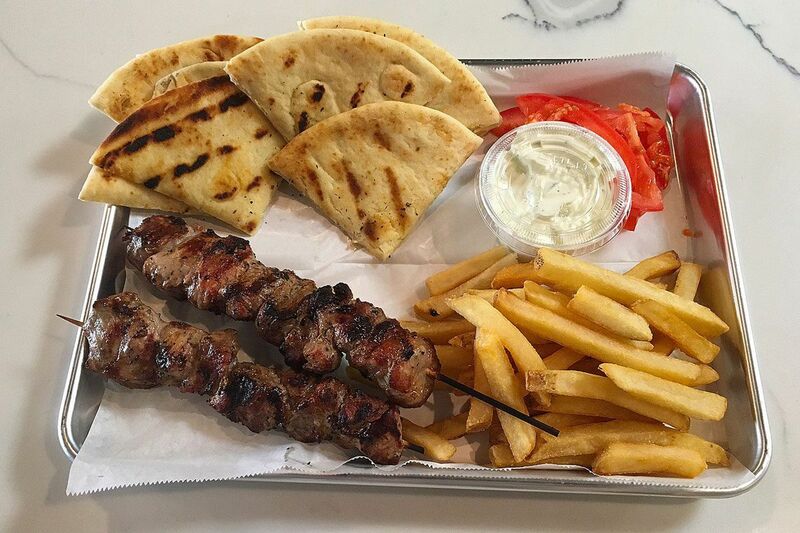 Pork souvlaki platter at Yeeroh, 1412 South St.
Yiannys Degermentzidis grew up in his father's pizza empire – the Delaware-based Pat's Pizza & Pasta. After Drexel University, he stayed in Philadelphia and liked what he saw. Choosing the food business, he dipped into his family's Greek heritage to open Yeeroh (1412 South St.), a fast-casual shop specializing in gyros (hence the name), souvlaki, and salads. "I used to go to Greece in the summer," Degermentzidis, 25, said. "This is Greek summer food." Rotisseries behind the counter at Yeeroh, 1412 South St. Basic order at the counter is an $8 pita (white or wheat) with a choice of gyro pork, chicken, or for an upcharge, lamb; or souvlaki (including vegetables); pantseta (pork belly); loukaniko (sausage); or fileto (marinated chicken). Platters ($12) include fries/zucchini fries, a spread, a side, and pita. Jasmine Lira and Yiannys Degermentzidis at Yeeroh, 1412 South St.
Desserts include baklava, rice pudding, and yogurt parfaits. Hours are 10 a.m. to 10 p.m. weekdays, 10 till "whenever" on weekends. Given the location just off Broad and South, Degermentzidis hopes to stay open till 3 a.m.
A minor Greek revolution is on the way, as similarly upstart Yiro Yiro is looking at an opening next week on Ridge Avenue in Roxborough. Chicken gyro at Yeeroh, 1412 South St.